Great 3D-code but the target plattform was just too weak. Also the selected copper-chunky looks plain ugly when watched too closely. Otherwise this was really nice and the music is very powerful. I agree with noname. The demo looked very ugly, but it was still a very impressive piece of coding and the music was indeed excellent. And TP4 definitely had some of the best releases ever. Exactly, one of te best code in its time of 1994 !! but no design or gfx etc but the code ! to bad musashi never evolved like chaos did ;) buzka! Even if ugly, it was very cool because it runs at descent speed in my A1200! 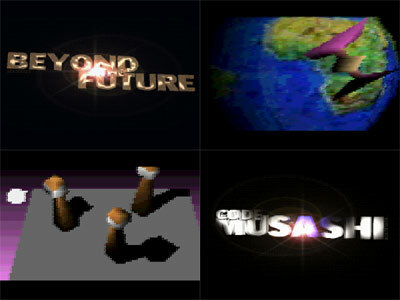 A lot of 3d to watch in this..
Musashi \o/ Impressive code for 1994 indeed. Very low res (but at least it's smooth) and possibly some of the shittiest colours schemes ever seen, but the demo is really dynamic and fun to watch. Good music by Scorpik too. The code is better than today. Beyound The Future indeed. Respect to the one of the best coders in scene history. Only 9th place... no idea why. Teh musik is teh horror, some nice ideas. Code was indeed beyond the future. I can't really understand why it is called ugly as design is in line with other demos of the time, except for low res. Maybe it's because of that lowres it was placed 9th? Technically stunning but ugly as hell! Quite a pity because it could have been a thrilling production. a bit ugly but faaaaast routines! Ugly, but impressive for 1994 and vanilla A1200. page created in 0.015470 seconds with 15 queries.